Phabrix Supports IP, 4K/UHD HDR Generation, Analysis & Monitoring. The top of the range Qx 12G is designed for next generation, hybrid IP/SDI environments using 4K/UHD (12G/6G/3G-SDI) and HD-SDI plus SMPTE 2110* and 2022-6. 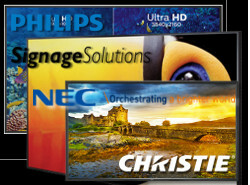 Leader’s 4K Solutions. The LV5480 and the LV5490 are two waveform monitors that can support 4K video signals.